Category: Small Machinery & Equipment. Good for melting, tempering and holding up to 18kgs of chocolate. Good for melting, tempering and holding up to 8kgs of 2 different chocolates simultaneously (provided they have similar tempering characteristics). 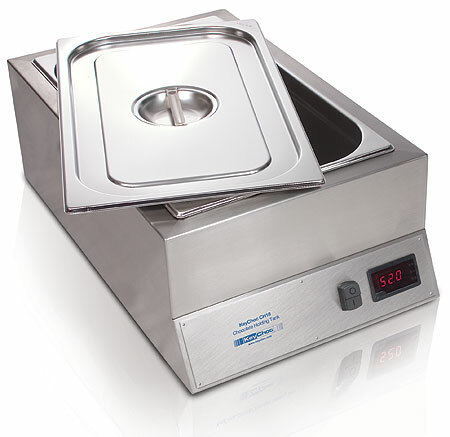 Good for melting, tempering and holding up to 8kgs of chocolate in the deep vat and using the shallow vat as a working area for dipping or hand rolling. Unlike many ordinary bain-maries, the CH series melting/ holding tanks are fitted with an accurate digital temperature control and are therefore suitable not only for melting and tempering chocolate (seed method), but also for holding it at a set temperature once it’s tempered. All these tanks are air heated and made from stainless steel. Please note that vats and lids are not supplied with the tanks and should be ordered separately as required.